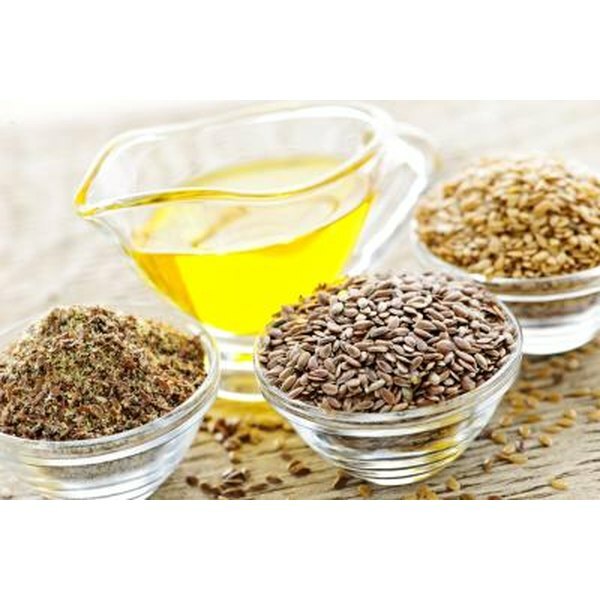 Does Flax Seed Oil Lower Triglycerides? Does Flaxseed Contain Soluble or Insoluble Fiber? Recent claims suggest flaxseed oil has many health benefits, helping to fight high flashes and cholesterol reduction and playing a role in cancer prevention. People have also used flaxseed oil to treat osteoarthritis, anxiety, vaginal infections, dry eyes, high blood pressure, heart disease, and diabetes. Commonly used for reducing health ailments, flaxseed oil is presently undergoing much research to unveil what it can truly do for your body. Believed to have originated in Egypt, flaxseed oil comes from the seeds of the flax plant. It commonly grows throughout the northwestern United States and Canada. Containing omega-3 and omega-6 fatty acids, flaxseed is a good source of healthy fats. In fact, some research suggests that flaxseed oil might have similar benefits to fish oil. Flaxseed oil is available in liquid and capsule form, and should be stored in your refrigerator. Like other oils, flaxseed oil is high in calories -- it contains 120 calories per 1-tablespoon serving. Rich in fiber, lignans, and alpha linolenic acid -- ALA -- a plant-based omega-3 fatty acid, flaxseed oil is believed to reduce cardiovascular risk factors. After conducting a double-blind, randomized, controlled clinical trial to better understand the effects of flaxseed on various cardiovascular risk factors in adults, researchers found that flaxseed lowered LDL, bad cholesterol, and positively impacted insulin sensitivity. Some research suggests that flaxseed oil may help with cancer prevention. Researchers have found that women who have higher levels of alpha-linolenic acid in their breast tissue are less likely to develop breast cancer. Because flaxseed oil is a good source of alpha-linolenic acid, scientists believe that it may help reduce your chances of getting breast cancer. Flaxseed oil also interacts with the breast cancer medication trastuzumab to fight cancer growth better than the medication on its own, reports a study published in "Food and Chemical Toxicology" in 2010. Sjogren' s syndrome is an autoimmune disease in which your immune system attacks glands in your body that play a role in moisture production, like salivary and tear glands. Evidence from one small study revealed that taking 1 to 2 g of flaxseed per day may lead to improved symptoms associated with dry eye in people with Sjogren' s syndrome. Lindsay Gulla started writing professionally in 2011. She is a health coach for a leading wellness company. Gulla holds a Master of Science in community health from Old Dominion University and a Bachelor of Science in health communication from James Madison University.